Welcome to our Teleflora Mother's Day Giveaway ~ 1 Winner ~ $75 Gift Card (Ends 5/06) #LoveOutLoud @Teleflora Enter to win this beautiful giveaway and show your mom some love!! Good Luck!!! 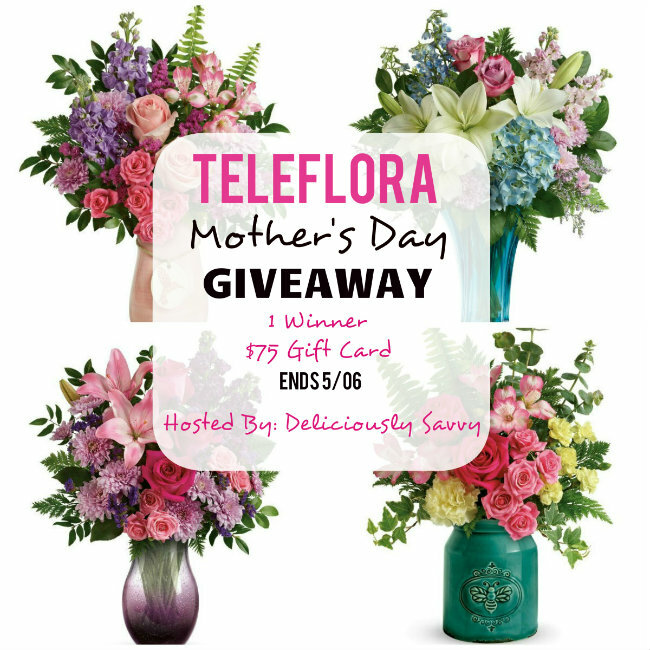 Welcome to the Teleflora Mother's Day Giveaway! 1 winner of $75 Gift Certificate to Teleflora Valued at $75 USD, plus free delivery service fee included. Expires on May 11, 2018. Good on Teleflora.com; no cash value. Not valid on sale items. Coupon cannot be combined with any other discount or promotion codes. One time use only. PLUS a Big Thank You To All Of The Supporting Blogs Promoting This Fabulous Mother's Day Giveaway! This giveaway is in no way endorsed, affiliated or associated with Facebook, Twitter or any other Social Media Networking Site. This giveaway is valid only in the United States. Entrants must be 18+ years of age to enter. This giveaway will end at 9PM (EST) on 05/06/2018. Deliciously Savvy did not receive any form of compensation for this giveaway. Once winner is selected via the Rafflecopter process, the product will be shipped. Winner have 24 hours to respond or another winner will be chosen. No other blog associated with this giveaway is responsible for the product shipment. Teleflora will be providing the prize above to the winner. This post does contain affiliate links. Thank You for stopping by! Any Questions or Concerns email me at mcushing7 (at) hotmail (dot) com.